To add contact fields to your quiz or survey, edit your quiz/survey and go to the "Contact" tab. When you load this tab for the first time, it will be completely empty. To add our first field, click the "Add New Field" button. When you add a new field, you will see a new white box appear. Each field has a few settings. After selecting the type, you will fill in the "Label". This will be the text that appears next to the field. The next option is the "Used For" option. 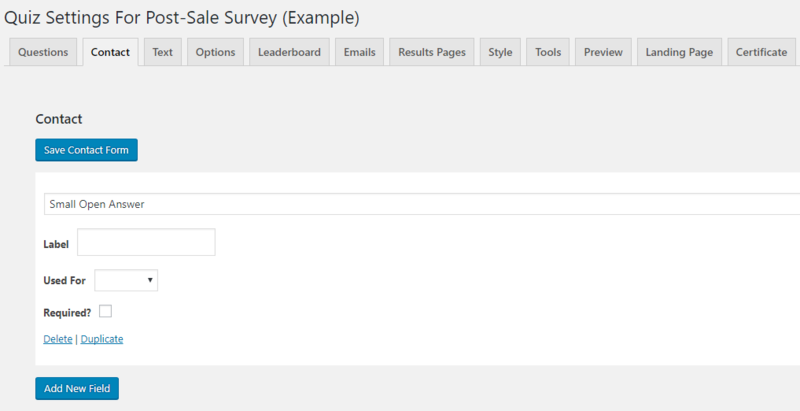 Throughout the plugin and its addons, there are many places that uses a quiz/survey takers name or email. You can set a field to be used for these places. The last option is the "Required?" option. 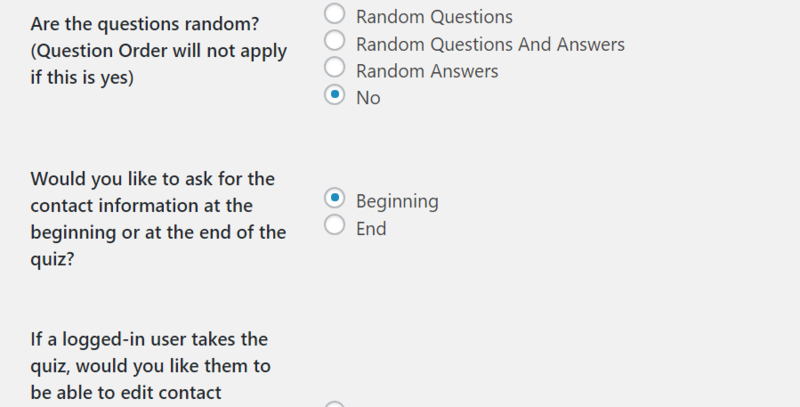 Checking this checkbox will force the user to fill in the field prior to submitting the quiz or survey. After you have added all of the fields you want, be sure to click the "Save Contact Form" button at the top of the "Contact" tab. To delete a field, click the "Delete" link at the bottom of the field. To duplicate a field, click the "Duplicate" link at the bottom of the field. Once you have your contact fields set up, the contact fields will automatically show up at the beginning of your quiz or survey. If you would like the contact fields to appear after the questions, you can do so on the "Options" tab. Go to the "Options" tab and set the "Would you like to ask for the contact information at the beginning or at the end of the quiz?" to "End" to have the contact fields appear after the questions. Be sure to save this tab if you make any changes.